The Clinical Simulation Center honors medical professionals who completed its one-year course. 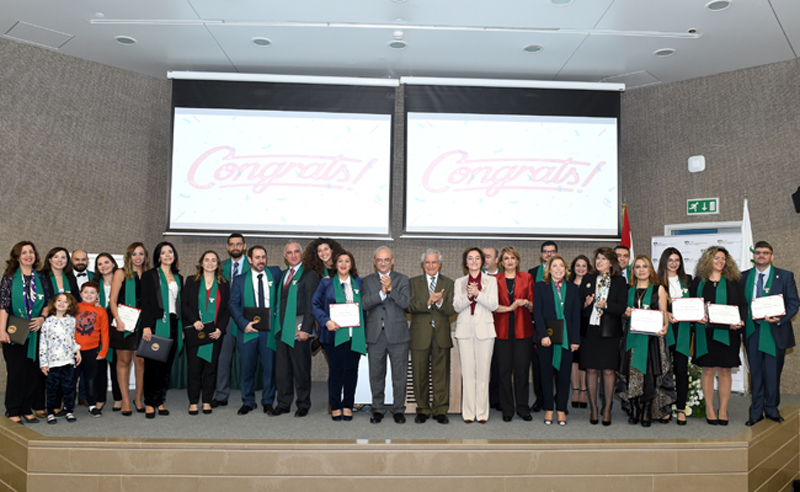 Graduates of the one-year clinical simulation program comprised medical specialists from LAU and other Lebanese universities, as well as professionals from across the region. “We need to be innovatively and creatively on the cutting edge of what we do,” LAU President Joseph G. Jabbra told an audience of medical professionals, their families, and LAU faculty and staff. “In the fourth industrial revolution, education is essential, but no longer sufficient.” Jabbra was speaking at the diploma ceremony for graduates of the university’s Clinical Simulation Center (LAU-CSC) program. 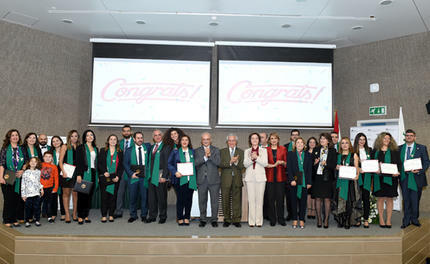 The 22 people honored at the event, which took place on November 25 at the Chagoury Health Sciences Center on the Byblos campus, were medical specialists from LAU and other Lebanese universities, as well as professionals from across the region, who had completed the course as part of their professional development and advancement. The Clinical Simulation Program was established in 2009 to teach doctors, nurses and pharmacists new medical techniques using interaction with standardized patients and simulation exercises, such as practice on mannequins and other training devices, with the aim of promoting safe and effective patient care and advancing science. The one-year program – organized in collaboration with Australia’s National Health Education and Training in Simulation Program (NHET-Sim) – was taught in three-day blocks to accommodate students who hold full-time jobs. Courses were led by Debra Nestel, fellow at the Academy of Medical Educators and professor of simulation education in healthcare at Monash in Australia; Guillaume Alinier, professor of Simulation in Healthcare Education at the UK’s University of Hertfordshire and director of Research at Hamad Medical Corporation’s Ambulance Service in Doha; and Jack Boulet, vice president for Research and Data Resources at the Foundation for Advancement of International Medical Education and Research. Certified by the American Heart Association and recently accredited by the Royal College of Physicians and Surgeons of Canada, LAU-CSC was designed to support interdisciplinary learning of LAU students at the Gilbert and Rose-Marie Chagoury School of Medicine, the Alice Ramez Chagoury School of Nursing and the School of Pharmacy. It also serves as a resource for LAU Medical Center-Rizk Hospital and the larger healthcare community. Diploma recipients Dr. Rima Nasser, orthopedic surgeon and head of the Residency Program at LAU Medical Center-Rizk Hospital, and Dr. Salah Malas, doctor of Obstetrics and Gynecology, showed a short video of their experience in the program, highlighting the techniques they learned and demonstrating how they will apply them in their medical practice. This was followed by a ceremony during which the graduates filed across the stage to the tune of “Pomp and Circumstance” to receive their diplomas and green sashes.